All operations go to the local datacenter cache, except for delete(), touchCheckKey(), and resetCheckKey(), which broadcast to all datacenters. This class is intended for caching data from primary stores. If the get() method does not return a value, then the caller should query the new value and backfill the cache using set(). The preferred way to do this logic is through getWithSetCallback(). When querying the store on cache miss, the closest DB replica should be used. Try to avoid heavyweight DB master or quorum reads. To ensure consumers of the cache see new values in a timely manner, you either need to follow either the validation strategy, or the purge strategy. A) The cached value is immutable. If the consumer has access to an identifier that uniquely describes a value, cached value need not change. Instead, the key can change. This also allows all servers to access their perceived current version. This is important in context of multiple deployed versions of your application and/or cross-dc database replication, to ensure deterministic values without oscillation. B) Validity is checked against the source after get(). This is the inverse of A. The unique identifier is embedded inside the value and validated after on retreival. If outdated, the value is recomputed. C) The value is cached with a modest TTL (without validation). If value recomputation is reasonably performant, and the value is allowed to be stale, one should consider using TTL only – using the value's age as method of validation. The purge strategy refers to the the approach whereby your application knows that source data has changed and can react by purging the relevant cache keys. As purges are expensive, this strategy should be avoided if possible. The simplest purge method is delete(). No matter which strategy you choose, callers must not rely on updates or purges being immediately visible to other servers. It should be treated similarly as one would a database replica. The need for immediate updates should be avoided. If needed, solutions must be sought outside WANObjectCache. 1) Use Route Prefixing based on region (datacenter) and cache cluster. See https://github.com/facebook/mcrouter/wiki/Routing-Prefix and https://github.com/facebook/mcrouter/wiki/Multi-cluster-broadcast-setup. 2) To increase the consistency of delete() and touchCheckKey() during cache server membership changes, you can use the OperationSelectorRoute to configure 'set' and 'delete' operations to go to all servers in the cache cluster, instead of just one server determined by hashing. See https://github.com/facebook/mcrouter/wiki/List-of-Route-Handles. B) Set up dynomite as a cache middleware between the web servers and either memcached or redis and use it as the underlying cache backend, using a memcached BagOStuff class for the 'cache' parameter. This will broadcast all key setting operations, not just purges, which can be useful for cache warming. Writes are eventually consistent via the Dynamo replication model. See https://github.com/Netflix/dynomite. Broadcasted operations like delete() and touchCheckKey() are intended to run immediately in the local datacenter and asynchronously in remote datacenters. This means that callers in all datacenters may see older values for however many milliseconds that the purge took to reach that datacenter. As with any cache, this should not be relied on for cases where reads are used to determine writes to source (e.g. non-cache) data stores, except when reading immutable data. Definition at line 116 of file WANObjectCache.php. Definition at line 254 of file WANObjectCache.php. References cache, null, and setLogger(). Get a TTL that is higher for objects that have not changed recently. // $ttl would be $minTTL. If $maxTTL was smaller than 720, $ttl would be $maxTTL. Another use case is when there are no applicable "last modified" fields in the DB, and there are too many dependencies for explicit purges to be viable, and the rate of change to relevant content is unstable, and it is highly valued to have the cached value be as up-to-date as possible. // Keep stale values around for doing comparisons for TTL calculations. // High values improve long-tail keys hit-rates, though might waste space. Definition at line 2033 of file WANObjectCache.php. Definition at line 1470 of file WANObjectCache.php. Definition at line 1924 of file WANObjectCache.php. Clear the in-process caches; useful for testing. Definition at line 1933 of file WANObjectCache.php. Purge a key from all datacenters. Note that set() can also be lag-aware and lower the TTL if it's high. Be aware that this does not clear the process cache. Even if it did, callbacks used by getWithSetCallback() might still return stale data in the case of either uncommitted or not-yet-replicated changes (callback generally use replica DBs). The $ttl parameter can be used when purging values that have not actually changed recently. For example, a cleanup script to purge cache entries does not really need a hold-off period, so it can use HOLDOFF_NONE. Likewise for user-requested purge. Note that $ttl limits the effective range of 'lockTSE' for getWithSetCallback(). If called twice on the same key, then the last hold-off TTL takes precedence. For idempotence, the $ttl should not vary for different delete() calls on the same key. Definition at line 703 of file WANObjectCache.php. References determineKeyClassForStats(), relayDelete(), and relayPurge(). Referenced by WANObjectCacheTest\testBusyValue(), WANObjectCacheTest\testGetMultiWithSetCallback(), WANObjectCacheTest\testGetMultiWithUnionSetCallback(), WANObjectCacheTest\testGetWithSetCallback(), WANObjectCacheTest\testGetWithSetCallback_versions(), WANObjectCacheTest\testInterimHoldOffCaching(), and WANObjectCacheTest\testLockTSE(). Definition at line 2327 of file WANObjectCache.php. Referenced by delete(), doGetWithSetCallback(), resetCheckKey(), and touchCheckKey(). Do the actual I/O for getWithSetCallback() when needed. Definition at line 1300 of file WANObjectCache.php. References $callbackDepth, $value, cache, checkAndSetCooloff(), determineKeyClassForStats(), false, getCurrentTime(), getInterimValue(), isAliveOrInGracePeriod(), isValid(), isVolatileValueAgeNegligible(), list, null, resolveCTL(), resolveTouched(), scheduleAsyncRefresh(), setInterimValue(), worthRefreshExpiring(), and worthRefreshPopular(). Referenced by getWithSetCallback(), and scheduleAsyncRefresh(). Fetch the value of a key from cache. If a key is tombstoned, $curTTL will reflect the time since delete(). However, pre-snapshot values might still be seen if an update was made in a remote datacenter but the purge from delete() didn't relay yet. Consider using getWithSetCallback() instead of get() and set() cycles. That method has cache slam avoiding features for hot/expensive keys. Otherwise, $info will transform into the cached value timestamp. Definition at line 331 of file WANObjectCache.php. Referenced by JobQueueDB\doDeduplicateRootJob(), WANObjectCacheTest\testCheckKeyInitHoldoff(), WANObjectCacheTest\testEpoch(), WANObjectCacheTest\testGetMultiWithSetCallback(), WANObjectCacheTest\testGetMultiWithUnionSetCallback(), WANObjectCacheTest\testGetWithSetCallback(), and WANObjectCacheTest\testLockTSESlow(). Fetch the value of a timestamp "check" key. The timestamp can be used to check whether a cached value is valid. Callers should not assume that this returns the same timestamp in all datacenters due to relay delays. The level of staleness can roughly be estimated from this key, but if the key was evicted from cache, such calculations may show the time since expiry as ~0 seconds. Note that "check" keys won't collide with other regular keys. Definition at line 737 of file WANObjectCache.php. Referenced by WANObjectCacheTest\testEpoch(), WANObjectCacheTest\testGetMulti(), WANObjectCacheTest\testGetMultiWithSetCallback(), WANObjectCacheTest\testGetMultiWithUnionSetCallback(), WANObjectCacheTest\testGetWithSetCallback(), and WANObjectCacheTest\testTouchKeys(). Definition at line 2448 of file WANObjectCache.php. Referenced by adaptiveTTL(), doGetWithSetCallback(), getInterimValue(), getMulti(), getMultiCheckKeyTime(), relayPurge(), and set(). Definition at line 1547 of file WANObjectCache.php. References $value, cache, getCurrentTime(), isValid(), list, null, unwrap(), and useInterimHoldOffCaching(). Definition at line 1907 of file WANObjectCache.php. References $code, cache, IExpiringStore\ERR_NO_RESPONSE, IExpiringStore\ERR_NONE, and IExpiringStore\ERR_UNREACHABLE. Fetch the value of several keys from cache. Pass $info as WANObjectCache::PASS_BY_REF to transform it into a map of cache keys to cache key info maps, each having the same style as those of WANObjectCache::get(). All the cache keys listed in $keys will have an entry. Othwerwise, $info will transform into a map of (cache key => cached value timestamp). Only the cache keys listed in $keys that exists or are tombstoned will have an entry. array $checkKeys List of check keys to apply to all $keys. May also apply "check" keys to specific cache keys only by using cache keys as keys in the $checkKeys array. Definition at line 370 of file WANObjectCache.php. References $value, array(), as, cache, getCurrentTime(), list, null, processCheckKeys(), and unwrap(). Referenced by get(), getMultiWithUnionSetCallback(), WANObjectCacheTest\testGetMulti(), and WANObjectCacheTest\testGetMultiCheckKeys(). Fetch the values of each timestamp "check" key. The later entities can each use a "check" key to invalidate their dependee entities. However, it is expensive for the former entities to verify against all of the relevant "check" keys during each getWithSetCallback() call. A less expensive approach is to do these verifications only after a "time-till-verify" (TTV) has passed. This is a middle ground between using blind TTLs and using constant verification. The adaptiveTTL() method can be used to dynamically adjust the TTV. Also, the initial TTV can make use of the last-modified times of the dependant entities (either from the DB or the "check" keys). Definition at line 802 of file WANObjectCache.php. References $time, as, cache, getCurrentTime(), makePurgeValue(), parsePurgeValue(), and string. Method to fetch multiple cache keys at once with regeneration. $oldAsOf : generation UNIX timestamp of $oldValue or null if not present Aside from the additional $id argument, the other arguments function the same way they do in getWithSetCallback(). Definition at line 1647 of file WANObjectCache.php. References as, getNonProcessCachedKeys(), getRawKeysForWarmup(), getWithSetCallback(), null, and use. Method to fetch/regenerate multiple cache keys at once. Definition at line 1742 of file WANObjectCache.php. References as, getMulti(), getNonProcessCachedKeys(), getRawKeysForWarmup(), getWithSetCallback(), null, and use. Definition at line 2394 of file WANObjectCache.php. Referenced by getMultiWithSetCallback(), and getMultiWithUnionSetCallback(). Definition at line 2379 of file WANObjectCache.php. Referenced by getNonProcessCachedKeys(), and getWithSetCallback(). Definition at line 1966 of file WANObjectCache.php. Definition at line 2414 of file WANObjectCache.php. References $warmupCache, as, and cache. Definition at line 2051 of file WANObjectCache.php. Referenced by WANObjectCacheTest\testGetMultiWithSetCallback(), and WANObjectCacheTest\testGetMultiWithUnionSetCallback(). Method to fetch/regenerate cache keys. It is strongly recommended to set the 'lag' and 'since' fields to avoid race conditions that can cause stale values to get stuck at keys. Usually, callbacks ignore the current value, but it can be used to maintain "most recent X" values that come from time or sequence based source data, provided that the "as of" id/time is tracked. Note that preemptive regeneration and $checkKeys can result in a non-false current value. Usage of $checkKeys is similar to get() and getMulti(). However, rather than the caller having to inspect a "current time left" variable (e.g. $curTTL, $curTTLs), a cache regeneration will automatically be triggered using the callback. checkKeys: List of "check" keys. The key at $key will be seen as stale when either touchCheckKey() or resetCheckKey() is called on any of the keys in this list. This is useful if thousands or millions of keys depend on the same entity. The entity can simply have its "check" key updated whenever the entity is modified. Default: . graceTTL: If the key is invalidated (by "checkKeys"/"touchedCallback") less than this many seconds ago, consider reusing the stale value. The odds of a refresh becomes more likely over time, becoming certain once the grace period is reached. This can reduce traffic spikes when millions of keys are compared to the same "check" key and touchCheckKey() or resetCheckKey() is called on that "check" key. This option is not useful for avoiding traffic spikes in the case of the key simply expiring on account of its TTL (use "lowTTL" instead). Default: WANObjectCache::GRACE_TTL_NONE. lockTSE: If the key is tombstoned or invalidated (by "checkKeys"/"touchedCallback") less than this many seconds ago, try to have a single thread handle cache regeneration at any given time. Other threads will use stale values if possible. If, on miss, the time since expiration is low, the assumption is that the key is hot and that a stampede is worth avoiding. Note that if the key falls out of cache then concurrent threads will all run the callback on cache miss until the value is saved in cache. The only stampede protection in that case is from duplicate cache sets when the callback takes longer than WANObjectCache::SET_DELAY_HIGH_MS milliseconds; consider using "busyValue" if such stampedes are a problem. Note that the higher "lockTSE" is set, the higher the worst-case staleness of returned values can be. Also note that this option does not by itself handle the case of the key simply expiring on account of its TTL, so make sure that "lowTTL" is not disabled when using this option. Avoid combining this option with delete() as it can always cause a stampede due to their being no stale value available until after a thread completes the callback. Use WANObjectCache::TSE_NONE to disable this logic. Default: WANObjectCache::TSE_NONE. busyValue: If no value exists and another thread is currently regenerating it, use this as a fallback value (or a callback to generate such a value). This assures that cache stampedes cannot happen if the value falls out of cache. This can be used as insurance against cache regeneration becoming very slow for some reason (greater than the TTL). Default: null. pcTTL: Process cache the value in this PHP instance for this many seconds. This avoids network I/O when a key is read several times. This will not cache when the callback returns false, however. Note that any purges will not be seen while process cached; since the callback should use replica DBs and they may be lagged or have snapshot isolation anyway, this should not typically matter. Default: WANObjectCache::TTL_UNCACHEABLE. pcGroup: Process cache group to use instead of the primary one. If set, this must be of the format ALPHANUMERIC_NAME:MAX_KEY_SIZE, e.g. "mydata:10". Use this for storing large values, small yet numerous values, or some values with a high cost of eviction. It is generally preferable to use a class constant when setting this value. This has no effect unless pcTTL is used. Default: WANObjectCache::PC_PRIMARY. version: Integer version number. This lets callers make breaking changes to the format of cached values without causing problems for sites that use non-instantaneous code deployments. Old and new code will recognize incompatible versions and purges from both old and new code will been seen by each other. When this method encounters an incompatibly versioned value at the provided key, a "variant key" will be used for reading from and saving to cache. The variant key is specific to the key and version number provided to this method. If the variant key value is older than that of the provided key, or the provided key is non-existant, then the variant key will be seen as non-existant. Therefore, delete() calls invalidate the provided key's variant keys. The "checkKeys" and "touchedCallback" options still apply to variant keys as usual. Avoid storing class objects, as this reduces compatibility (due to serialization). Default: null. minAsOf: Reject values if they were generated before this UNIX timestamp. This is useful if the source of a key is suspected of having possibly changed recently, and the caller wants any such changes to be reflected. Default: WANObjectCache::MIN_TIMESTAMP_NONE. hotTTR: Expected time-till-refresh (TTR) in seconds for keys that average ~1 hit per second (e.g. 1Hz). Keys with a hit rate higher than 1Hz will refresh sooner than this TTR and vise versa. Such refreshes won't happen until keys are "ageNew" seconds old. This uses randomization to avoid triggering cache stampedes. The TTR is useful at reducing the impact of missed cache purges, since the effect of a heavily referenced key being stale is worse than that of a rarely referenced key. Unlike simply lowering $ttl, seldomly used keys are largely unaffected by this option, which makes it possible to have a high hit rate for the "long-tail" of less-used keys. Default: WANObjectCache::HOT_TTR. lowTTL: Consider pre-emptive updates when the current TTL (seconds) of the key is less than this. It becomes more likely over time, becoming certain once the key is expired. This helps avoid cache stampedes that might be triggered due to the key expiring. Default: WANObjectCache::LOW_TTL. ageNew: Consider popularity refreshes only once a key reaches this age in seconds. Default: WANObjectCache::AGE_NEW. touchedCallback: A callback that takes the current value and returns a UNIX timestamp indicating the last time a dynamic dependency changed. Null can be returned if there are no relevant dependency changes to check. This can be used to check against things like last-modified times of files or DB timestamp fields. This should generally not be used for small and easily queried values in a DB if the callback itself ends up doing a similarly expensive DB query to check a timestamp. Usages of this option makes the most sense for values that are moderately to highly expensive to regenerate and easy to query for dependency timestamps. The use of "pcTTL" reduces timestamp queries. Default: null. Definition at line 1215 of file WANObjectCache.php. References $value, doGetWithSetCallback(), getProcessCache(), makeGlobalKey(), null, and use. Referenced by getMultiWithSetCallback(), getMultiWithUnionSetCallback(), WANObjectCacheTest\testBusyValue(), WANObjectCacheTest\testGetWithSetCallback(), WANObjectCacheTest\testGetWithSetcallback_touched(), WANObjectCacheTest\testGetWithSetCallback_versions(), WANObjectCacheTest\testInterimHoldOffCaching(), WANObjectCacheTest\testLockTSE(), WANObjectCacheTest\testLockTSESlow(), and WANObjectCacheTest\testPreemtiveRefresh(). Check if a key is fresh or in the grace window and thus due for randomized reuse. If $curTTL > 0 (e.g. not expired) this returns true. Otherwise, the chance of returning true decrease steadily from 100% to 0% as the |$curTTL| moves from 0 to $graceTTL seconds. This handles widely varying levels of cache access traffic. If $curTTL <= -$graceTTL (e.g. already expired), then this returns false. Definition at line 2140 of file WANObjectCache.php. Definition at line 2235 of file WANObjectCache.php. Referenced by doGetWithSetCallback(), and getInterimValue(). Definition at line 1458 of file WANObjectCache.php. Definition at line 1884 of file WANObjectCache.php. Referenced by User\getCacheKey(), getWithSetCallback(), and WANObjectCacheTest\testEpoch(). Definition at line 1873 of file WANObjectCache.php. Referenced by InfoAction\getCacheKey(), LinkCache\getMutableCacheKeys(), and WANObjectCacheTest\testGetWithSetCallback(). Definition at line 1894 of file WANObjectCache.php. Definition at line 2371 of file WANObjectCache.php. Referenced by getMultiCheckKeyTime(), processCheckKeys(), and relayPurge(). Get an instance that wraps EmptyBagOStuff. Definition at line 278 of file WANObjectCache.php. Referenced by JobQueueDB\__construct(), FileBackendStore\__construct(), Wikimedia\Rdbms\LBFactory\__construct(), FileRepo\__construct(), Wikimedia\Rdbms\LoadBalancer\__construct(), ClassicInterwikiLookupTest\testArrayStorage(), ClassicInterwikiLookupTest\testCDBStorage(), ClassicInterwikiLookupTest\testDatabaseStorage(), ClassicInterwikiLookupTest\testGetAllPrefixes(), and WANObjectCacheTest\testNewEmpty(). string | array | bool $value Possible string of the form "PURGED:<timestamp>:<holdoff>"
Definition at line 2338 of file WANObjectCache.php. Referenced by getMultiCheckKeyTime(), processCheckKeys(), reapCheckKey(), and unwrap(). Definition at line 2314 of file WANObjectCache.php. Definition at line 469 of file WANObjectCache.php. References as, cache, makePurgeValue(), and parsePurgeValue(). Set a key to soon expire in the local cluster if it pre-dates $purgeTimestamp. This sets stale keys' time-to-live at HOLDOFF_TTL seconds, which both avoids broadcasting in mcrouter setups and also avoids races with new tombstones. Definition at line 1819 of file WANObjectCache.php. Set a "check" key to soon expire in the local cluster if it pre-dates $purgeTimestamp. Definition at line 1848 of file WANObjectCache.php. Do the actual async bus delete of a key. Definition at line 2092 of file WANObjectCache.php. Referenced by delete(), and resetCheckKey(). Do the actual async bus purge of a key. This must set the key to "PURGED:<UNIX timestamp>:<holdoff>"
Definition at line 2065 of file WANObjectCache.php. References cache, getCurrentTime(), and makePurgeValue(). Referenced by delete(), and touchCheckKey(). Delete a "check" key from all datacenters, invalidating keys that use it. c) Since "check" keys are initialized only on the server the key hashes to, any temporary ejection of that server will cause the value to be seen as purged as a new server will initialize the "check" key. The advantage here is that the "check" keys, which have high TTLs, will only be created when a get*() method actually uses that key. This is better when a large number of "check" keys are invalided in a short period of time. Definition at line 904 of file WANObjectCache.php. Definition at line 1505 of file WANObjectCache.php. Definition at line 1529 of file WANObjectCache.php. Definition at line 2112 of file WANObjectCache.php. References $asyncHandler, doGetWithSetCallback(), null, and use. Set the value of a key in cache. Simply calling this method when source data changes is not valid because the changes do not replicate to the other WAN sites. In that case, delete() should be used instead. This method is intended for use on cache misses. Setting 'lag' and 'since' help avoids keys getting stuck in stale states. Be aware that this does not update the process cache for getWithSetCallback() callers. Keys accessed via that method are not generally meant to also be set using this primitive method. Do not use this method on versioned keys accessed via getWithSetCallback(). staleTTL: seconds to keep the key around if it is stale. The get()/getMulti() methods return such stale values with a $curTTL of 0, and getWithSetCallback() will call the regeneration callback in such cases, passing in the old value and its as-of time to the callback. This is useful if adaptiveTTL() is used on the old value's as-of time when it is verified as still being correct. Default: WANObjectCache::STALE_TTL_NONE. Definition at line 554 of file WANObjectCache.php. References cache, getCurrentTime(), null, use, and wrap(). Referenced by JobQueueDB\doDeduplicateRootJob(), WANObjectCacheTest\testCheckKeyInitHoldoff(), WANObjectCacheTest\testEpoch(), WANObjectCacheTest\testGetMulti(), and WANObjectCacheTest\testGetMultiCheckKeys(). Definition at line 1568 of file WANObjectCache.php. References cache, use, and wrap(). Definition at line 269 of file WANObjectCache.php. Definition at line 2466 of file WANObjectCache.php. Referenced by WANObjectCacheTest\testBusyValue(), WANObjectCacheTest\testEpoch(), WANObjectCacheTest\testGetMulti(), WANObjectCacheTest\testGetMultiCheckKeys(), WANObjectCacheTest\testGetMultiWithSetCallback(), WANObjectCacheTest\testGetMultiWithUnionSetCallback(), WANObjectCacheTest\testGetWithSetCallback(), WANObjectCacheTest\testGetWithSetcallback_touched(), WANObjectCacheTest\testInterimHoldOffCaching(), WANObjectCacheTest\testLockTSE(), WANObjectCacheTest\testLockTSESlow(), WANObjectCacheTest\testPreemtiveRefresh(), and WANObjectCacheTest\testTouchKeys(). Purge a "check" key from all datacenters, invalidating keys that use it. This should only be called when the underlying data (being cached) changes in a significant way, and it is impractical to call delete() on all keys that should be changed. When get() is called on those keys, the relevant "check" keys must be supplied for this to work. The "check" key essentially represents a last-modified time of an entity. When the key is touched, the timestamp will be updated to the current time. Keys using the "check" key via get(), getMulti(), or getWithSetCallback() will be invalidated. This approach is useful if many keys depend on a single entity. The timestamp of the "check" key is treated as being HOLDOFF_TTL seconds in the future by get*() methods in order to avoid race conditions where keys are updated with stale values (e.g. from a lagged replica DB). A high TTL is set on the "check" key, making it possible to know the timestamp of the last change to the corresponding entities in most cases. This might use more cache space than resetCheckKey(). When a few important keys get a large number of hits, a high cache time is usually desired as well as "lockTSE" logic. The resetCheckKey() method is less appropriate in such cases since the "time since expiry" cannot be inferred, causing any get() after the reset to treat the key as being "hot", resulting in more stale value usage. Definition at line 867 of file WANObjectCache.php. 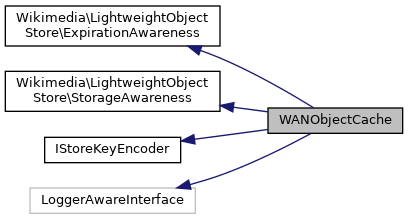 Referenced by WANObjectCacheTest\testEpoch(), WANObjectCacheTest\testGetMultiCheckKeys(), WANObjectCacheTest\testGetWithSetCallback(), and WANObjectCacheTest\testTouchKeys(). Do not use this method outside WANObjectCache. Definition at line 2276 of file WANObjectCache.php. Referenced by getInterimValue(), and getMulti(). Enable or disable the use of brief caching for tombstoned keys. Definition at line 1957 of file WANObjectCache.php. 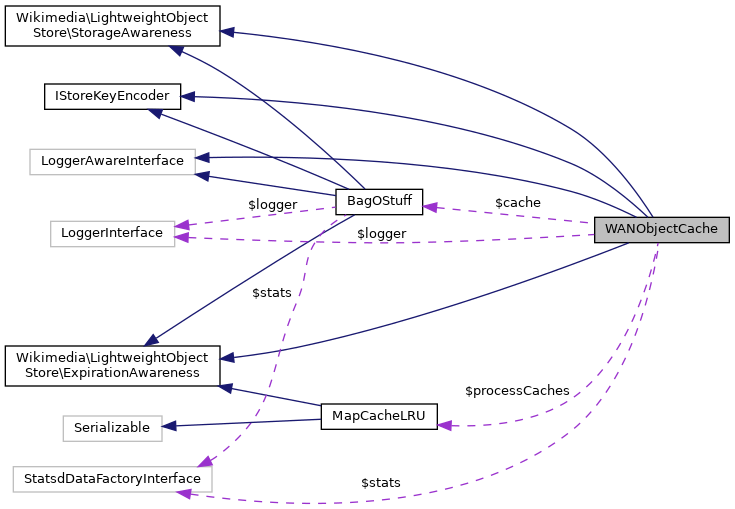 Referenced by getInterimValue(), and WANObjectCacheTest\testInterimHoldOffCaching(). Check if a key is nearing expiration and thus due for randomized regeneration. This returns false if $curTTL >= $lowTTL. Otherwise, the chance of returning true increases steadily from 0% to 100% as the $curTTL moves from $lowTTL to 0 seconds. This handles widely varying levels of cache access traffic. If $curTTL <= 0 (e.g. already expired), then this returns false. Definition at line 2170 of file WANObjectCache.php. Referenced by doGetWithSetCallback(), and isAliveOrInGracePeriod(). Check if a key is due for randomized regeneration due to its popularity. This is used so that popular keys can preemptively refresh themselves for higher consistency (especially in the case of purge loss/delay). Unpopular keys can remain in cache with their high nominal TTL. This means popular keys keep good consistency, whether the data changes frequently or not, and long-tail keys get to stay in cache and get hits too. Similar to worthRefreshExpiring(), randomization is used. Definition at line 2199 of file WANObjectCache.php. Definition at line 2258 of file WANObjectCache.php. Referenced by set(), and setInterimValue(). Function that takes a WAN cache callback and runs it later. Definition at line 134 of file WANObjectCache.php. Definition at line 118 of file WANObjectCache.php. Definition at line 139 of file WANObjectCache.php. Cache cluster name for mcrouter use. Definition at line 126 of file WANObjectCache.php. Unix timestamp of the oldest possible valid values. Definition at line 136 of file WANObjectCache.php. Definition at line 128 of file WANObjectCache.php. Definition at line 122 of file WANObjectCache.php. Map of group PHP instance caches. Definition at line 120 of file WANObjectCache.php. Physical region for mcrouter use. Definition at line 124 of file WANObjectCache.php. Definition at line 130 of file WANObjectCache.php. Whether to use "interim" caching while keys are tombstoned. Definition at line 132 of file WANObjectCache.php. Definition at line 146 of file WANObjectCache.php. Definition at line 141 of file WANObjectCache.php. Definition at line 143 of file WANObjectCache.php. Never consider performing "popularity" refreshes until a key reaches this age. Definition at line 168 of file WANObjectCache.php. Seconds to keep dependency purge keys around. Definition at line 156 of file WANObjectCache.php. Definition at line 221 of file WANObjectCache.php. Seconds to no-op key set() calls to avoid large blob I/O stampedes. Definition at line 163 of file WANObjectCache.php. Definition at line 214 of file WANObjectCache.php. Definition at line 215 of file WANObjectCache.php. Definition at line 213 of file WANObjectCache.php. Referenced by WANObjectCacheTest\testReap(), and WANObjectCacheTest\testReap_fail(). Definition at line 212 of file WANObjectCache.php. Definition at line 211 of file WANObjectCache.php. Definition at line 210 of file WANObjectCache.php. Idiom for set()/getWithSetCallback() for "no post-expired grace period". Definition at line 187 of file WANObjectCache.php. Hits/second for a refresh to be expected within the "popularity" window. Definition at line 172 of file WANObjectCache.php. Idiom for delete() for "no hold-off". Definition at line 183 of file WANObjectCache.php. Referenced by WANObjectCacheTest\testDelete(), WANObjectCacheTest\testGetMultiCheckKeys(), and RevisionDbTestBase\testNewKnownCurrent(). Definition at line 153 of file WANObjectCache.php. The time length of the "popularity" refresh window for hot keys. Definition at line 170 of file WANObjectCache.php. Definition at line 218 of file WANObjectCache.php. Seconds to keep interim value keys for tombstoned keys around. Definition at line 158 of file WANObjectCache.php. Seconds to keep lock keys around. Definition at line 161 of file WANObjectCache.php. Default remaining TTL at which to consider pre-emptive regeneration. Definition at line 165 of file WANObjectCache.php. Max time expected to pass between delete() and DB commit finishing. Definition at line 149 of file WANObjectCache.php. Definition at line 151 of file WANObjectCache.php. Idiom for getWithSetCallback() for "no minimum required as-of timestamp". Definition at line 190 of file WANObjectCache.php. Definition at line 220 of file WANObjectCache.php. Parameter to get()/getMulti() to return extra information by reference. Definition at line 205 of file WANObjectCache.php. Definition at line 228 of file WANObjectCache.php. Definition at line 223 of file WANObjectCache.php. Referenced by WANObjectCacheTest\testGetWithSeveralCheckKeys(), and WANObjectCacheTest\testReap(). Seconds to ramp up to the "popularity" refresh chance after a key is no longer new. Definition at line 174 of file WANObjectCache.php. Definition at line 202 of file WANObjectCache.php. Definition at line 200 of file WANObjectCache.php. Milliseconds of delay after get() where set() storms are a consideration with 'lockTSE'. Definition at line 198 of file WANObjectCache.php. Idiom for set()/getWithSetCallback() for "do not augment the storage medium TTL". Definition at line 185 of file WANObjectCache.php. Definition at line 219 of file WANObjectCache.php. Tiny negative float to use when CTL comes up >= 0 due to clock skew. Definition at line 193 of file WANObjectCache.php. Tiny positive float to use when using "minTime" to assert an inequality. Definition at line 195 of file WANObjectCache.php. Idiom for getWithSetCallback() callbacks to 'lockTSE' logic. Definition at line 179 of file WANObjectCache.php. Max TTL to store keys when a data sourced is lagged. Definition at line 181 of file WANObjectCache.php. Definition at line 177 of file WANObjectCache.php. Referenced by Skin\buildSidebar(), MediaWiki\Storage\SqlBlobStore\getCacheTTL(), ForeignDBFile\getDescriptionText(), File\getDescriptionText(), MediaWiki\Storage\NameTableStore\getName(), and Title\loadRestrictions(). Definition at line 217 of file WANObjectCache.php. Referenced by WANObjectCacheTest\testGetMultiWithSetCallback(), and WANObjectCacheTest\testReap(). Definition at line 208 of file WANObjectCache.php. Definition at line 225 of file WANObjectCache.php. Definition at line 226 of file WANObjectCache.php.